The Residence GB Holiday Homes Sicily is a two-story structure overlooking the crystalline sea of Balestrate, a small seaside town located on the Gulf of Castellammare. Two-room standard 4 +2 (ground floor , 1st and 2nd floor) . Each apartment consists of kitchen / living room, double bedroom , twin bedroom, bathroom with shower and balcony or veranda. Each unit is equipped with the following services: air conditioning / heating in the living area, kitchenette with 4 ring hob , fridge freezer, washing machine , hair dryer for your hair, toast bread , microwave, iron and ironing board, internet wi-fi , TV with digital terrestrial and satellite TV, and a sofa bed in the living room. Some apartments have sea view, while others front . Consumption of water, power and gas, wi- fi, a supply of bed and bath linen ( sheets , towels , tablecloths shower) . Transfers to and from the airport to Palermo or Trapani. BY PLANE: Once you arrive at the airport "Falcone-Borsellino (ex- Punta Raisi), take highway A29 Palermo-Trapani. Approximately 15 minutes drive from the motorway exit "Balestrate". Off the motorway follow the signs "Balestrate". TRAIN: Arriving at Palermo's central station, take the local train for Trapani, and get off at the railway station Balestrate, located in the urban center of country. Info: www.trenitalia. en BY BOAT: From Port of Palermo take highway A29 Palermo-Trapani. About 30 minutes drive from the motorway exit "Balestrate". Off the motorway follow the signs "Balestrate". From Naples and Cagliari: Info: www.snavali.com and www.tirrenia.it From Genoa, Rome and Livorno: Info: www.gnv.it BY CAR: Once in Palermo take the highway A29 Palermo-Trapani. Approximately 30 minutes by car from the highway exit "Balestrate". Off the motorway follow the signs "Balestrate". Balestrate , enchanting seascape offers many tourist attractions that are sure to impress visitors : in fact enjoys the view of the sea . The Residence offers 4 apartments for 1 to 6 persons , tastefully furnished and equipped with all amenities suitable for families with children and groups . Each unit has a living room with kitchen , bedroom , bathroom, and balcony or veranda with sea view. Its strategic location provides easy access to famous places such as western Sicily Scopello, the Zingaro Nature Reserve , San Vito lo Capo , Segesta, Mondello , Monreale and Palermo, Trapani and their respective airports ( 40 and 50 km from Balestrate) . The property is newly built and is about 200 meters from the sea, 500 meters from the wonderful marina and 900 meters from the beach. Its location is particularly interesting since it is located directly on the seafront road parallel to the main road Balestrate, the heart of the lively summer . 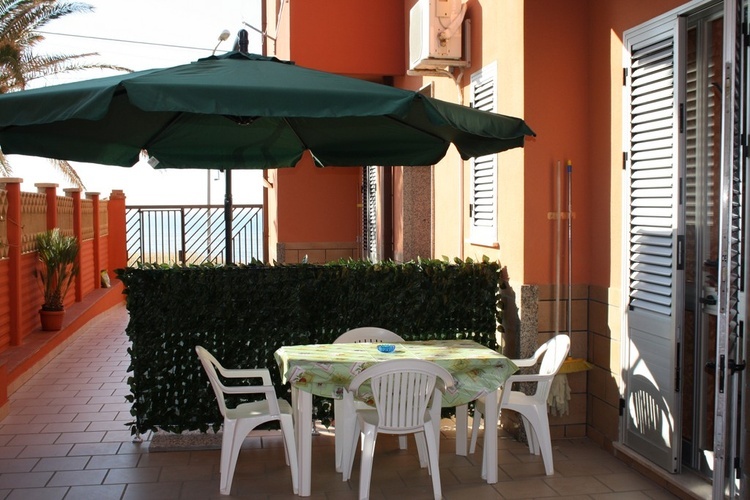 A few steps away are supermarkets, restaurants, bars, pubs, pizzeria , wine bar. Possibility of free car parking available to our guests. The wonderful location of the residence allows its guests to enjoy magnificent views of enriched by beautiful sunsets reflected in the gulf . Restaurants , pizzerias , bars, pubs , spa, supermarket, newsagent , tobacconist , butcher shop, travel agency, church , internet point. Musical Dancing Karaoke Cabaret Shows , Disco . SPOKEN LANGUAGE: English, Italian , French, Spanish , German . FREE: It will be our pleasure to your arrival in the cottages , you find our welcome gift : a bottle of fresh water , a bottle of Sicilian wine , fresh fruit, and candy.